$5 per person (Car show only) Collected at toll booth at Pacific Raceways. Admission to the car show is free with a stamped score card. 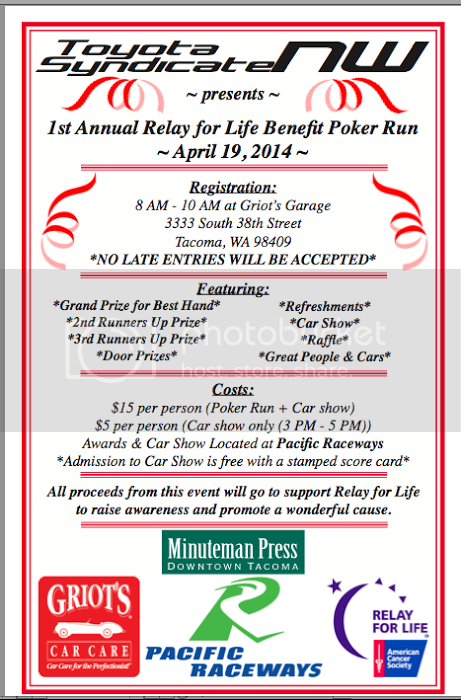 All proceeds from this event will go to support Relay for Life to raise awareness and promote a wonderful cause. Relay For Life events are life-changing cancer fundraising events that help communities across the globe fight back against cancer. Each year, more than 4 million people in over 20 countries raise much-needed funds and awareness to save lives from cancer through the Relay For Life movement. Hopefully we'll see some other people out there! 2001 Red Celica GT-S "Hannah"
1993 Formerly Blue Celica Alltrac "Alexandra"
Just a couple days away now!